As the last of this year’s crop of U.S. college graduates march across the stage to receive their diplomas, more of them than ever are likely to be from overseas. In fact, a new Pew Research Center analysis of degrees granted by American colleges and universities shows that foreign students earn more than half of the advanced degrees in many science, technology, engineering and mathematics (STEM) fields. Foreign students earned just 11.6% of all doctorates conferred by U.S. colleges and universities in the 2012-2013 academic year, but they comprise 56.9% of all doctoral degrees in engineering; 52.5% of all doctorates in computer and information sciences; and half of all doctorates in mathematics and statistics, according to data from the National Center for Education Statistics. At the baccalaureate level, foreign students still are overrepresented in STEM degrees, though the numbers are smaller. In 2012-2013, foreign students received just 3.5% of bachelor’s degrees from U.S. colleges and universities, but they earned 10.2% of all degrees in mathematics and statistics, 7.9% of all engineering degrees, and 6.7% of all bachelor’s degrees in architecture and related services. We examined foreign students’ growing presence on U.S. campuses, their countries of origin and their fields of study. During the 2013-2014 year, more than 886,000 students from other countries were enrolled in U.S. colleges and universities or doing “optional practical training” – work related to their field of study. The foreign student population grew 72% from 1999 to 2013, according to the New York-based Institute of International Education; nearly all the increase came from Asian countries. Following China is India, with 102,673 students in the U.S., and South Korea, with just over 68,000. The Asian country with the biggest percentage increase over that same period? Vietnam, which sent more than seven times as many students in 2013-2014 (16,579) to U.S. institutions of higher learning as it did in 1999-2000 (2,266). Among non-Asian countries, the most significant increase was Saudi Arabia, which sent nearly 10 times as many students to U.S. colleges and universities in 2013-2014 (53,919) as it did 15 years earlier (5,156). U.S. colleges and universities have long sought to attract top students from abroad, for both academic and financial reasons. As The Washington Post noted a few years back, “[i]nternational students are particularly coveted by public universities, where they pay two or three times the tuition charged to state residents.” Many schools use commissioned agents to recruit international students, a practice that was formally endorsed by the National Association for College Admission Counseling in 2013. Foreign students at U.S. colleges are more concentrated in STEM fields than U.S. college students as a whole. Among foreign students at all academic levels, business was the most popular field of study in 2013-2014 (188,179). 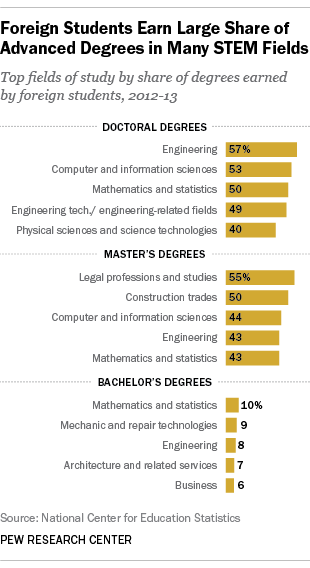 But the next-most-popular fields were engineering (160,128) and computer and information sciences (65,291). By contrast, the most popular fields of study for U.S. students at all levels were health professions, business, liberal arts/humanities and education; computer sciences and engineering ranked seventh and 10th, respectively. But that doesn’t mean all foreign students have similar academic profiles. About three-fourths of Indian students (74%), for example, were studying some form of science, math or engineering in 2013-2014, a share exceeded only by Iranians (77.4%). Business was the single most popular area of study for Vietnamese (37.5%) and Chinese (28%) students, while the countries with the highest share of students studying intensive English (not typically a degree program on its own) were Kuwait (28.2%) and Saudi Arabia (24%).